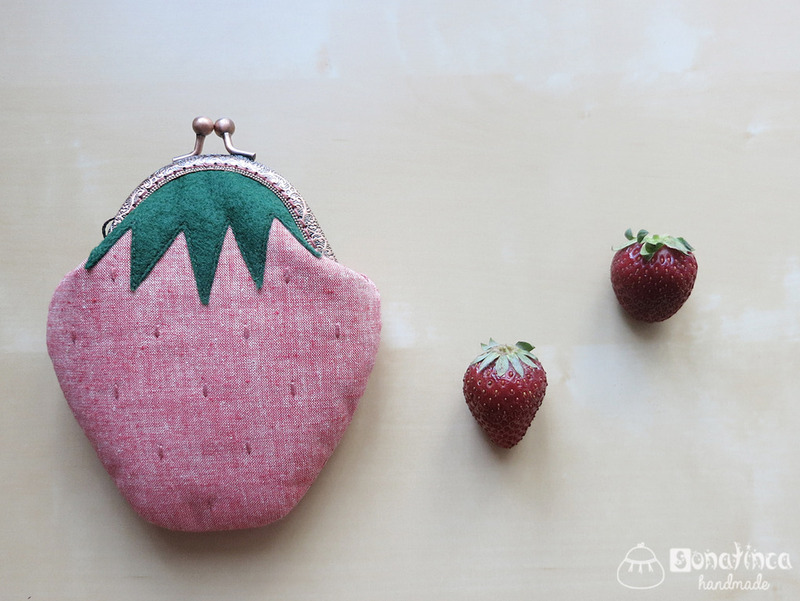 Home » Purse » How to Sew a Purse "Strawberry"
How to Sew a Purse "Strawberry"
The size of the finished purse 12.5 x 14 cm. 2. 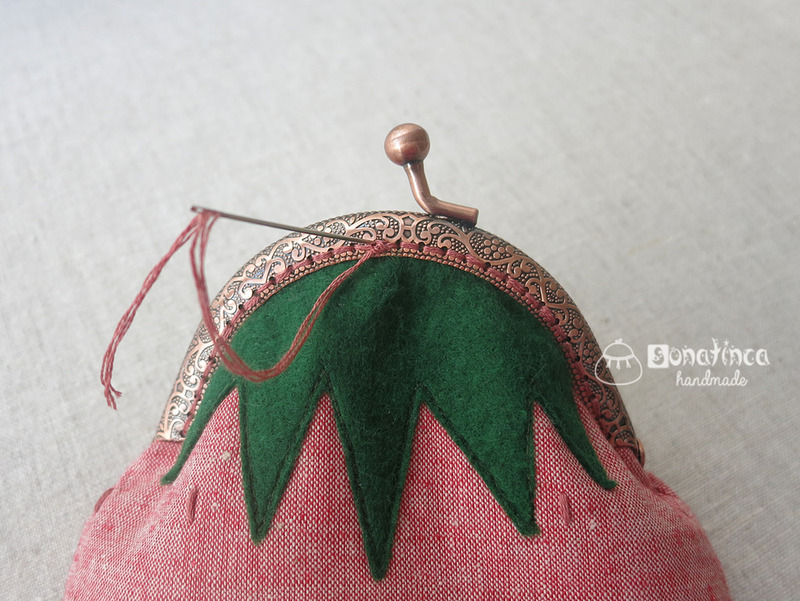 Basic and lining fabric. 3. Interfacing thin and voluminous. 4. 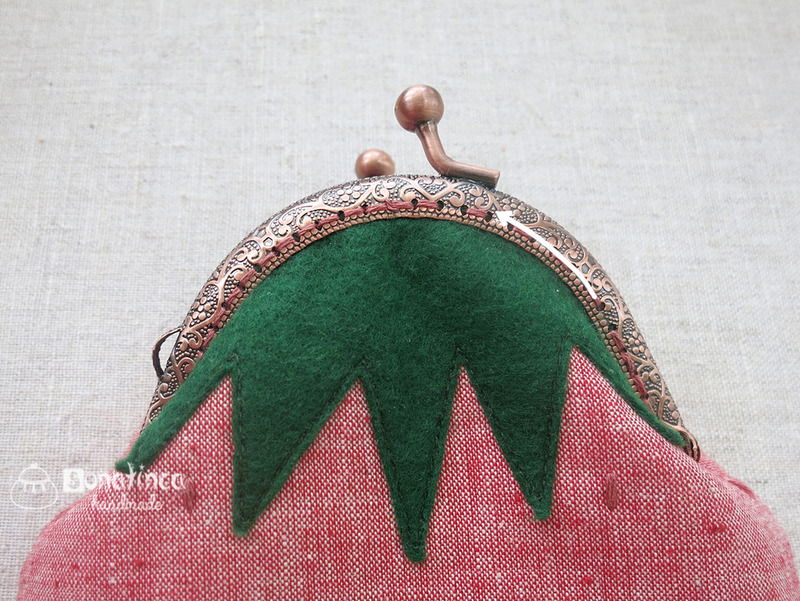 Felt or fleece green. 5. 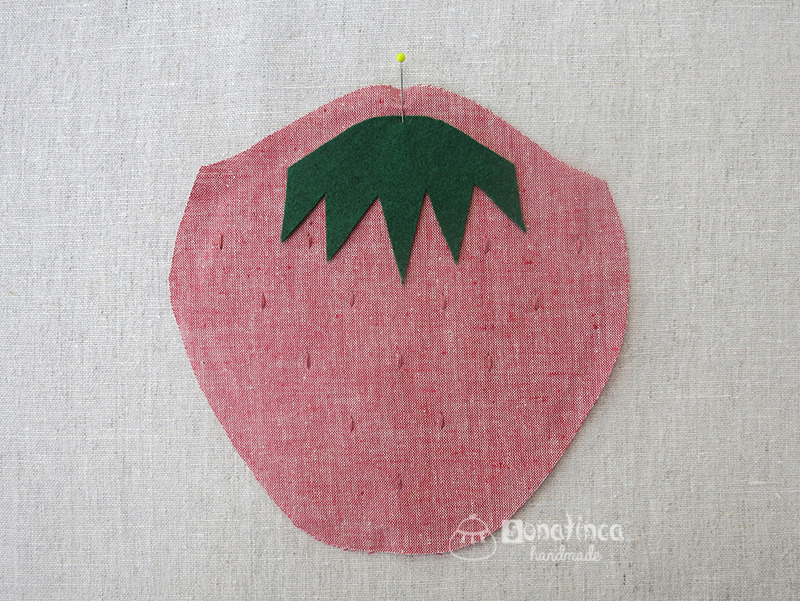 Muline color strawberry seeds. Print the pattern. To check the accuracy of the pattern, there is a control of 1 cm length on it. The arrow indicates the direction of the warp thread. 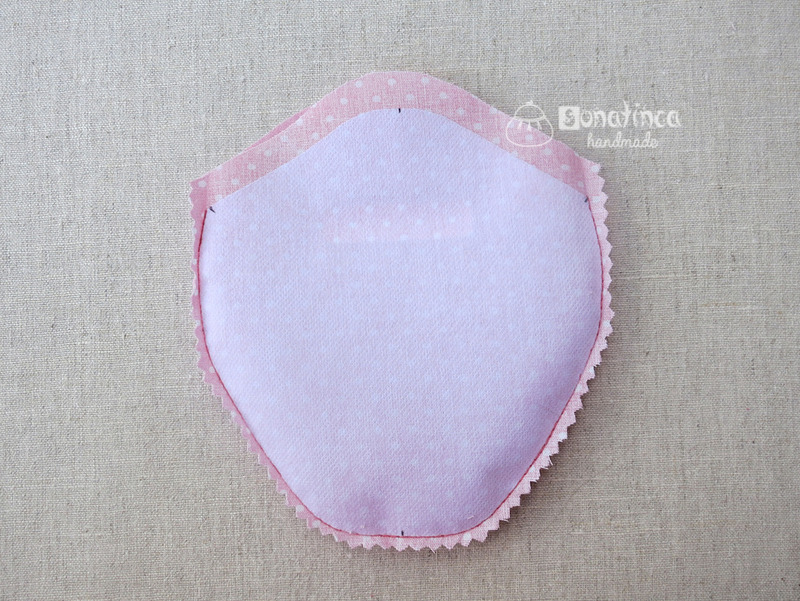 The pattern is given without seam allowances. The recommended allowance is 1 cm. Step 1. 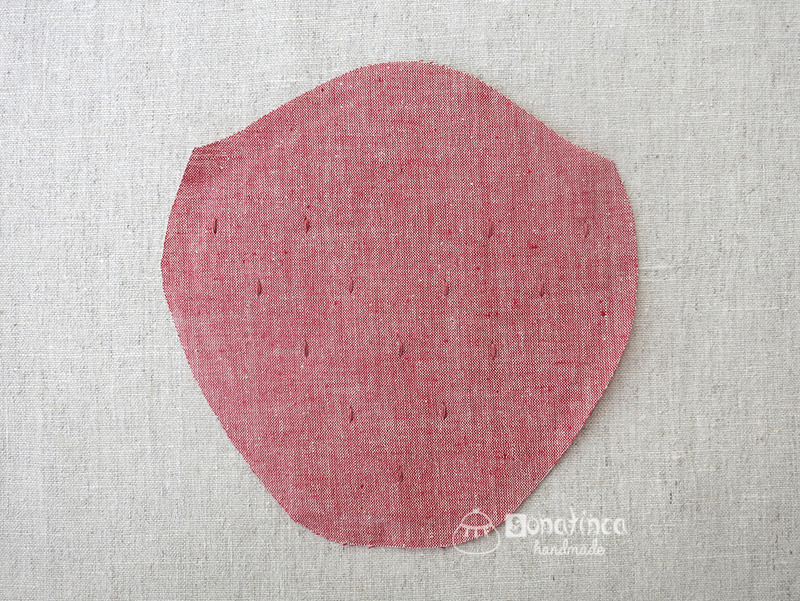 Cut out from the main fabric - a detail of 1 - 2 pieces, from a lining fabric - a detail of 1 - 2 pieces. Transfer to all the details of the labels A, A1, C, C1. 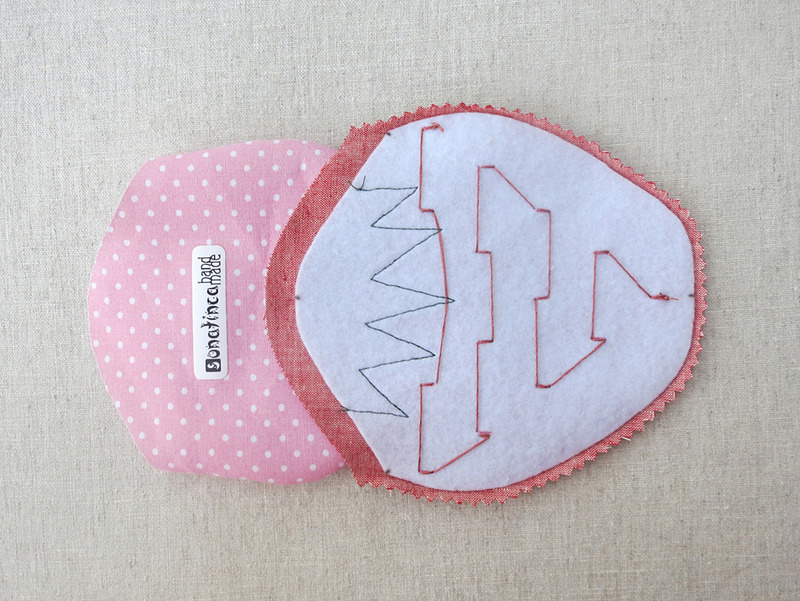 Duplicate parts from the main fabric with bulky interfacing, lining fabric with thin parts. Step 2. 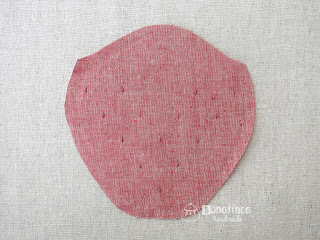 From the inside of both parts of the main fabric, make tags for embroidery seeds. Step 3. 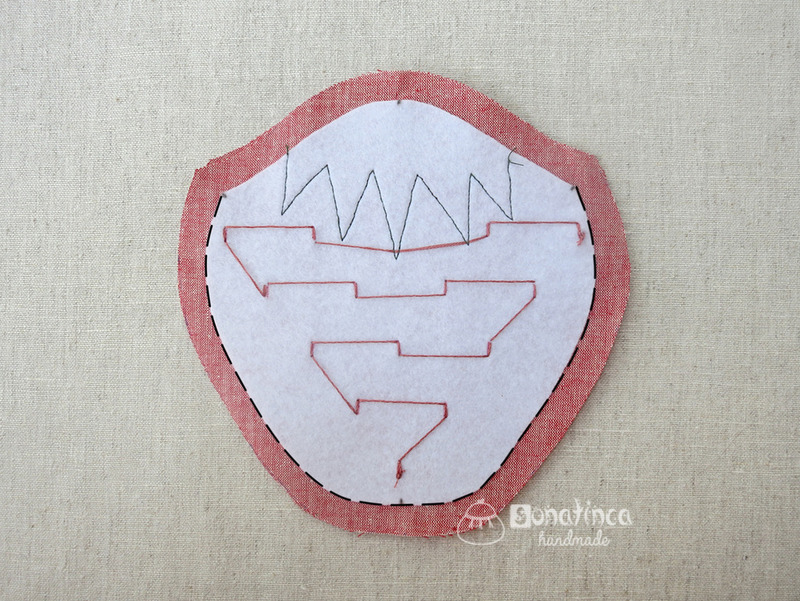 Take the pattern of part 1 and cut the leaves. 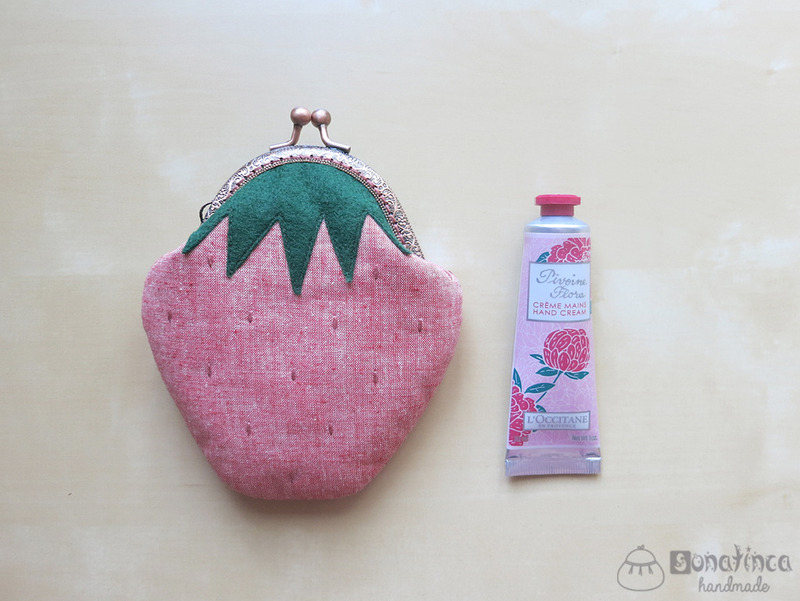 Cut out 2 pcs. 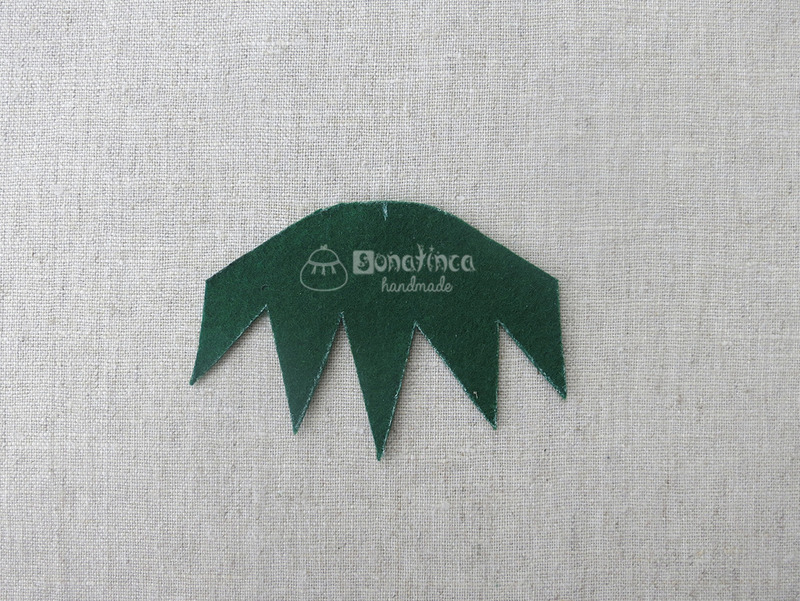 leaves of felt (or fleece). On both parts, transfer the label C.
Step 4. 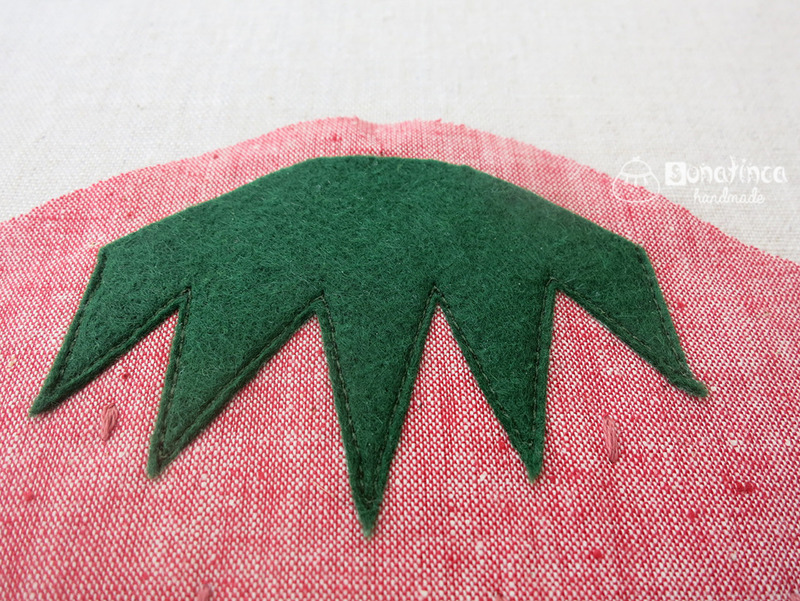 Lay the leaves with the wrong side on the front side of each of the parts from the main fabric. Align the marks C on the parts of leaves and parts 1. 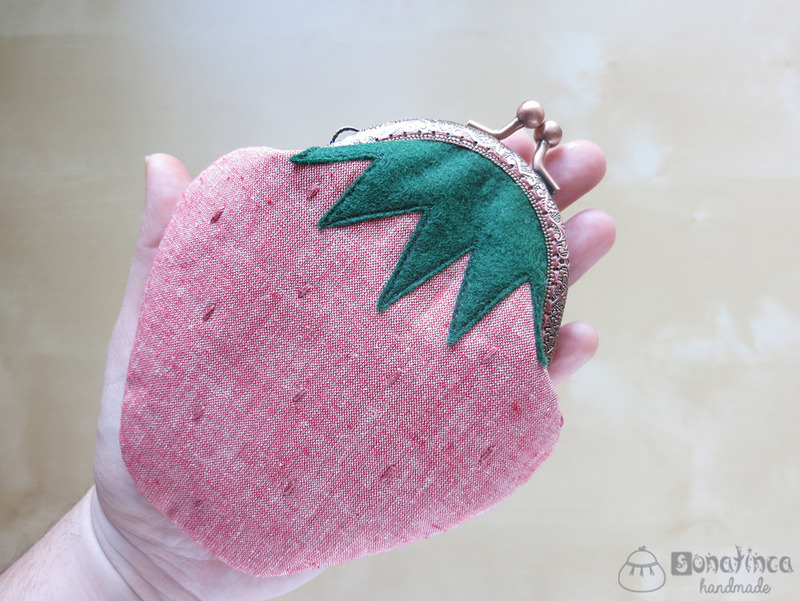 Sew the leaves. 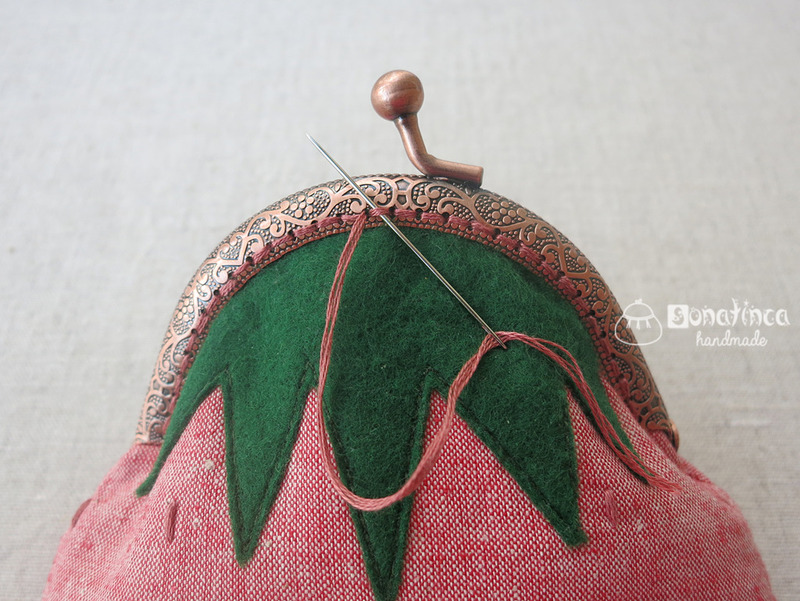 For smoother sewing, reduce the stitch width to 1.5 - 2 mm. Step 5. Fold the main fabric parts facing each other. Sew down the lower edge of the mark A to the mark A1 through the mark C1. As far as possible, smooth the allowances on both sides. 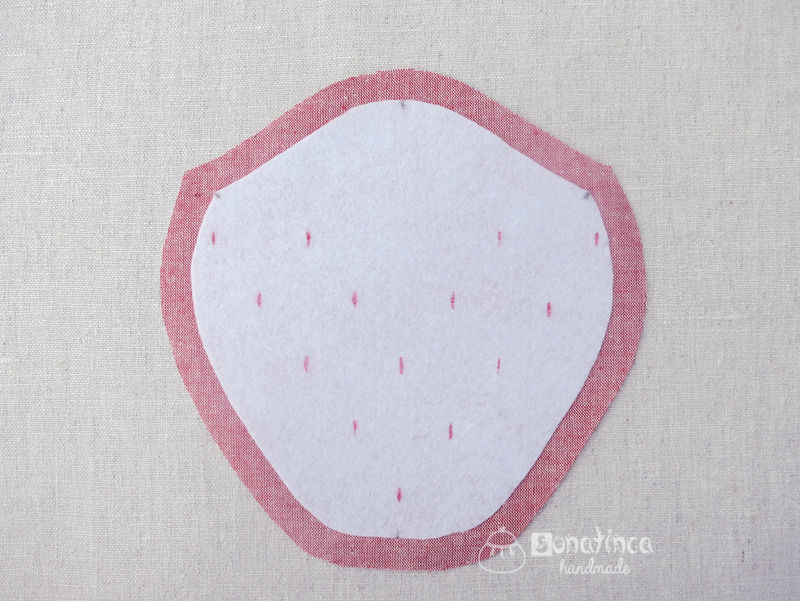 Cut them down or cut them with scalloped scissors, not reaching 1 mm before the line. Step 6. 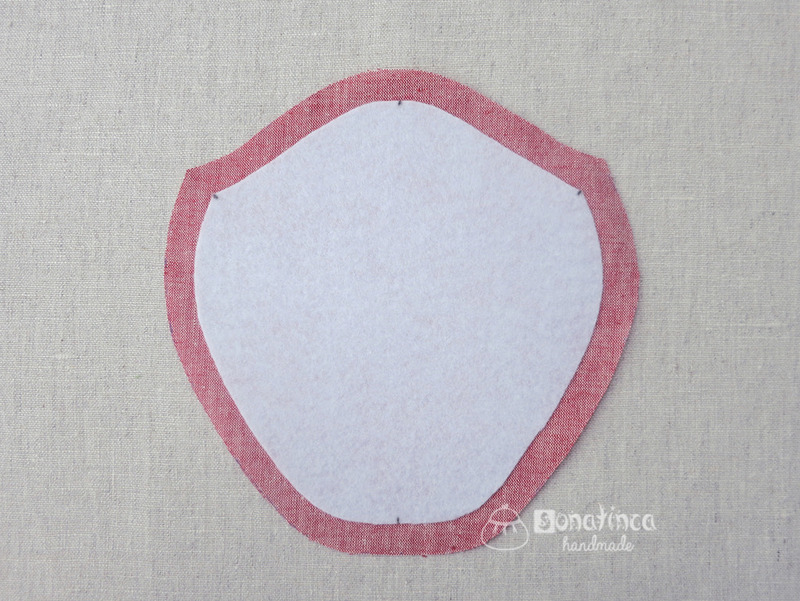 Repeat Step 6 for the lining fabric parts 1. Step 7. Turn the turned lining detail on the front side. Insert it into the base part. Split pins or sweep along the top edges. 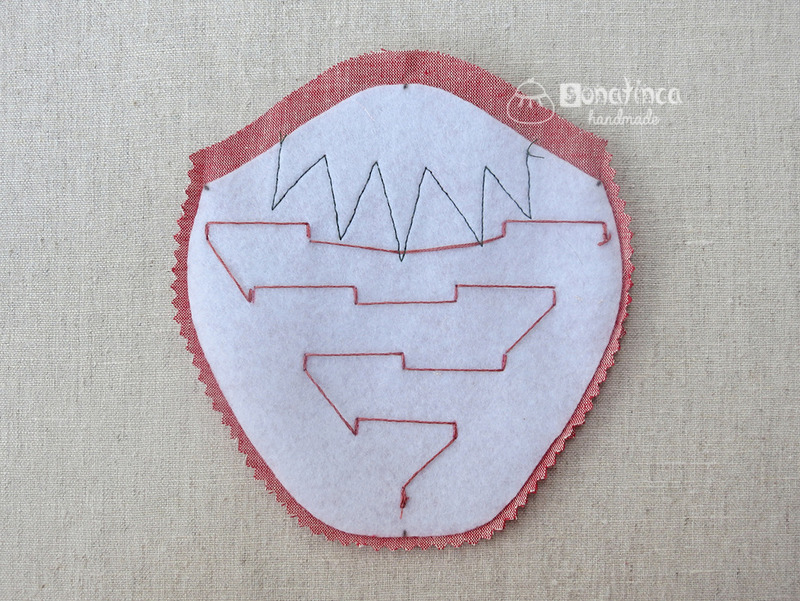 Ensure that points A, A1 and C on the base and lining details match. 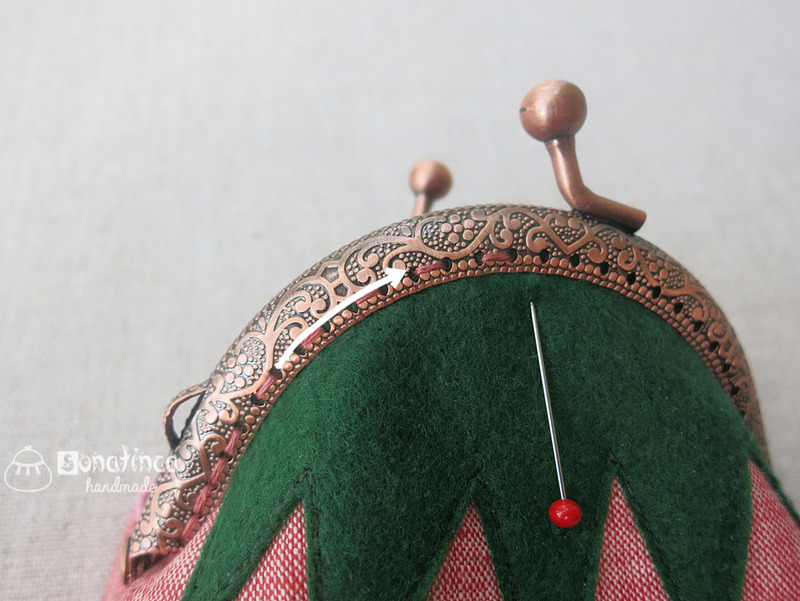 Sew the parts along the top edge from point A to point A1 through point C. Leave a turning hole on one of the sides. 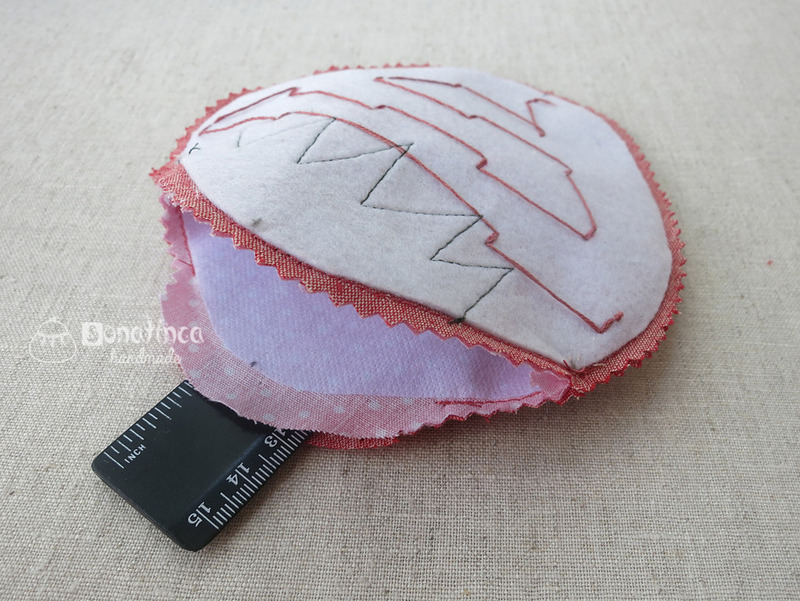 Everywhere, except for the area of the inversion hole, cut the allowances of scalloped scissors along the upper edge at a distance of 1 mm from the seam, or cut the seam allowance with ordinary scissors. Step 8. 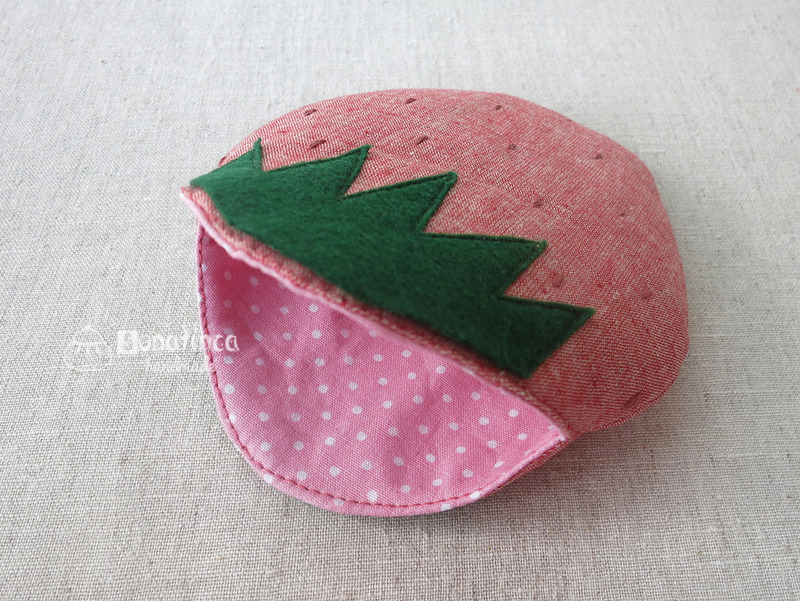 Through the hole for turning out, turn out the wallet on the front side. Carefully straighten the allowances inside. 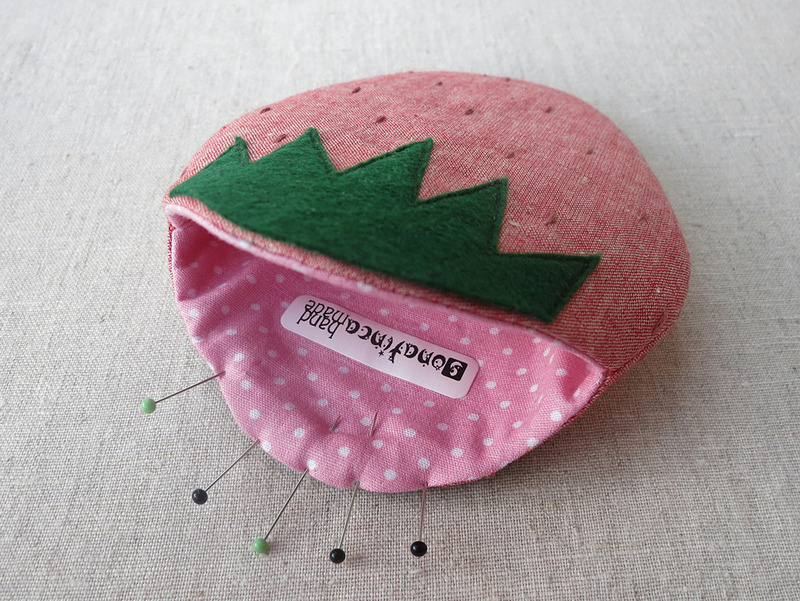 Split the pins or sew the hole for turning, removing the allowances inside. 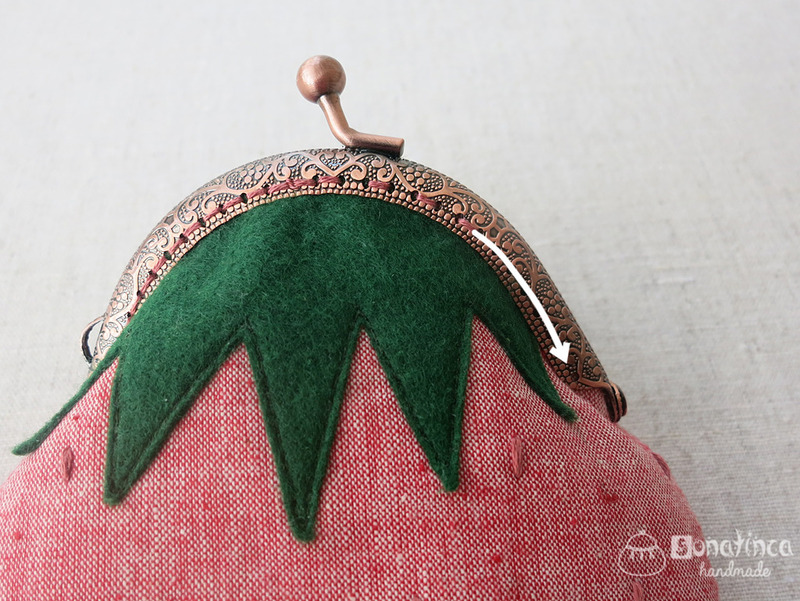 Perform stitching along the upper edge of the purse at a distance of 1 mm from the edge. Step 9. 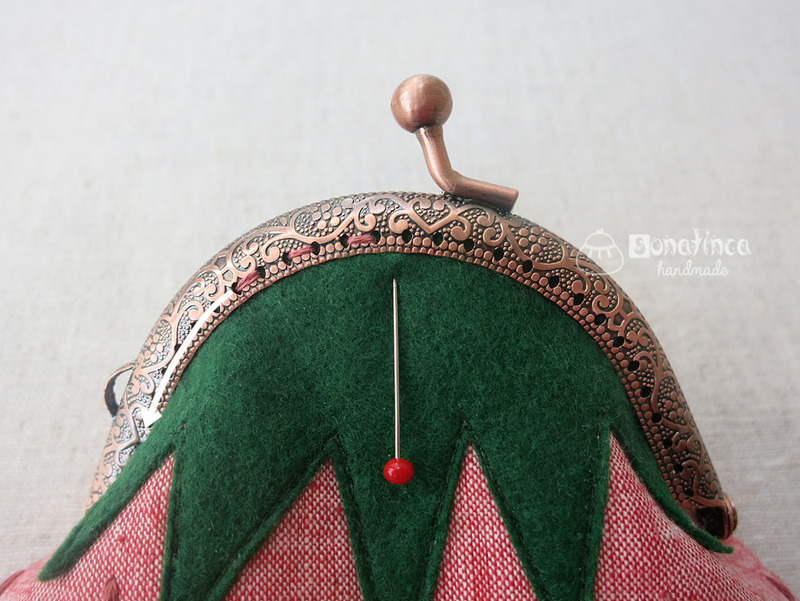 Determine the middle of the top edge of the purse. 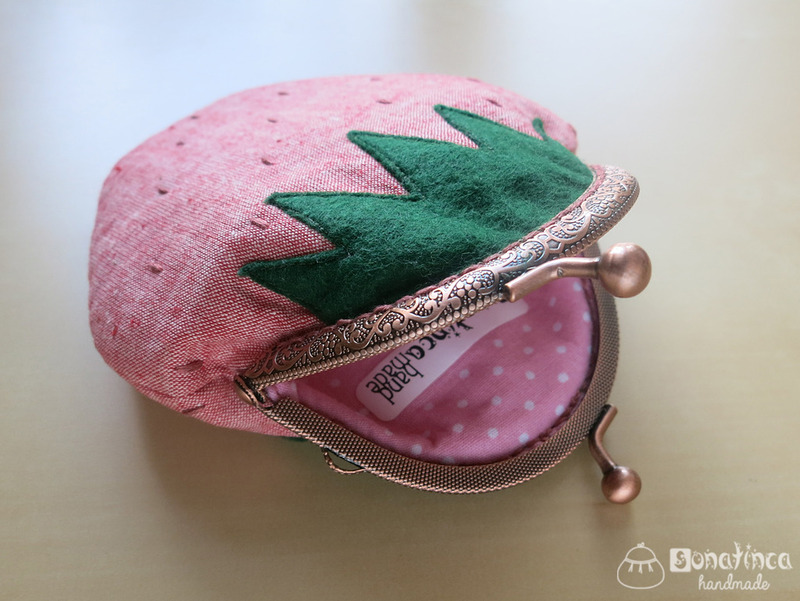 To do this, fold in half purse, connecting points A and A1. Mark the middle on both sides. 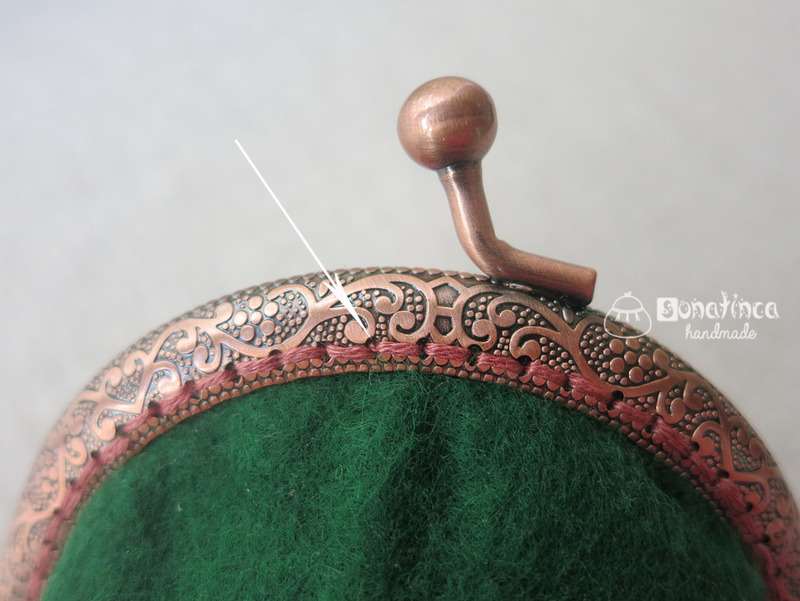 You can determine the middle on the clasp, considering the number of holes for sewing. 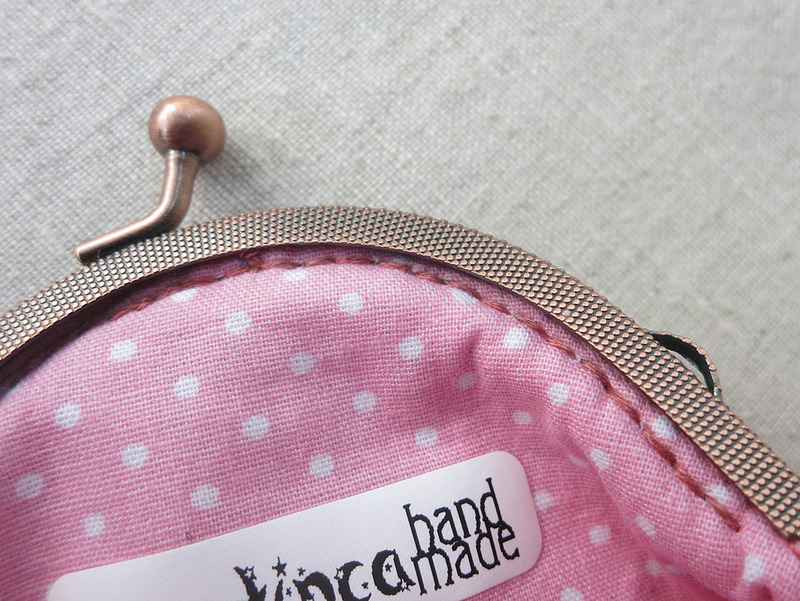 Align center on the clasp, and on the purse. 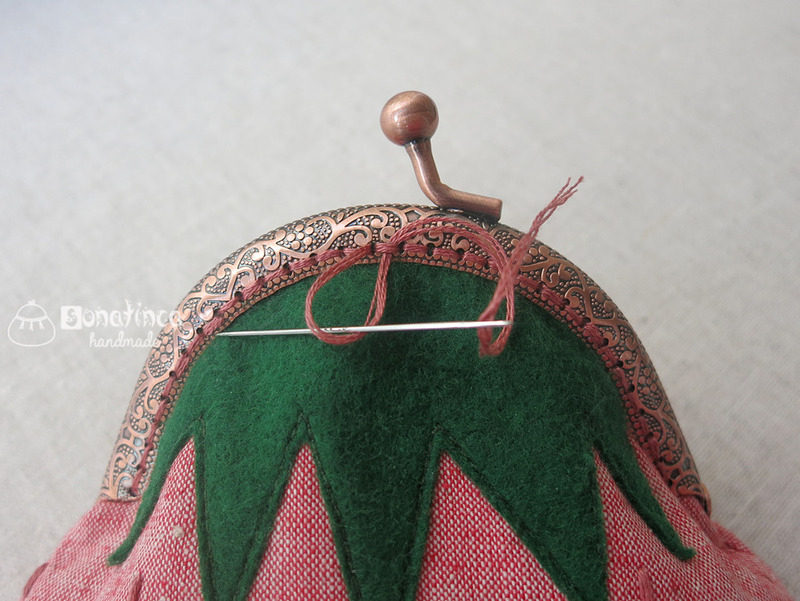 Begin to sew the clasp from the center to the edge with a “needle forward” seam. 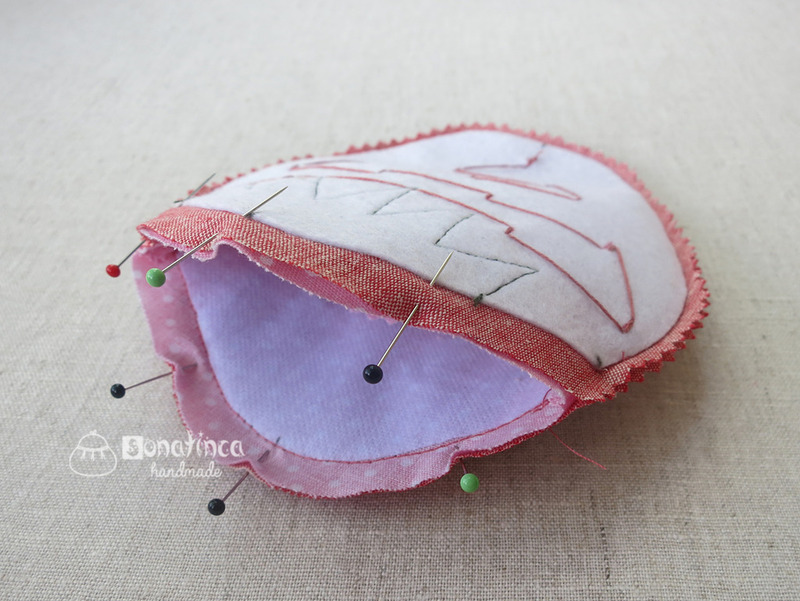 Reaching the last hole, sew in the opposite direction with the same stitch, as if closing gaps. 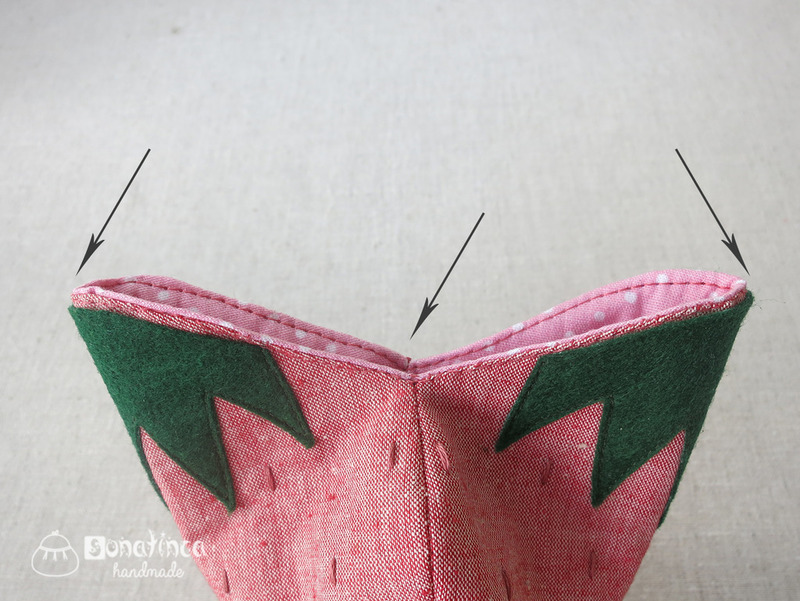 The seam can be seen from the side of the lining, so make sure that there are no gaps in it, and the stitches go straight along the arc. 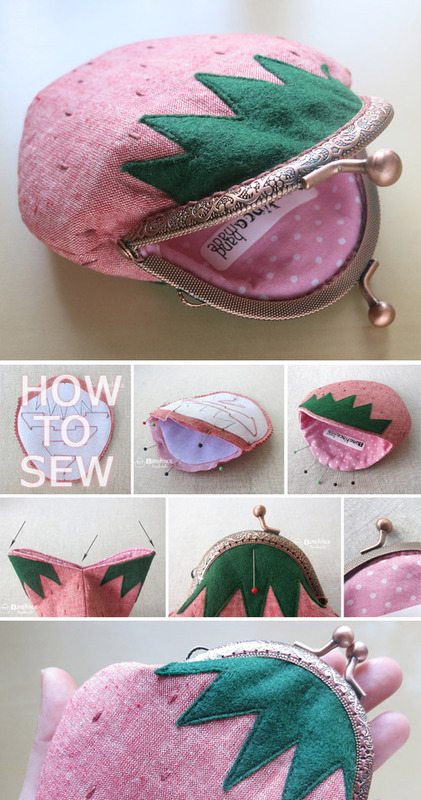 Sew to the opposite end. And go back to the center. Step 10. 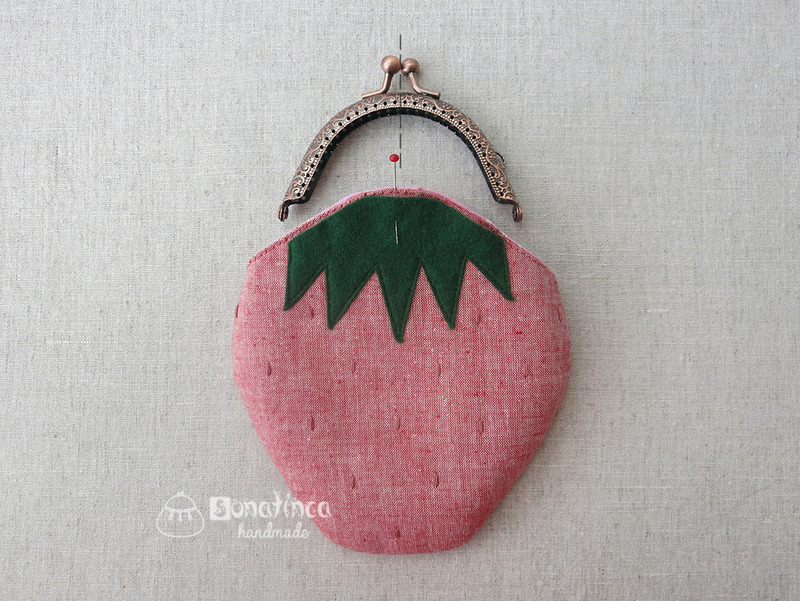 When you reach the starting point, pull the needle into the next stitch. And pull the thread into the resulting loop. ... so that he disappears under the clasp. Cut the thread.